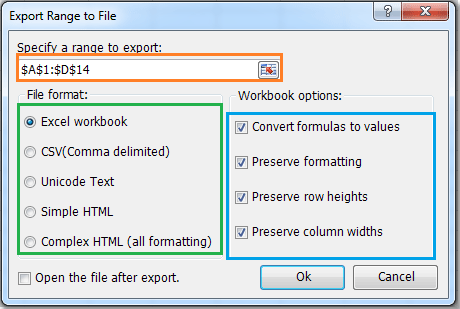 Kutools for Excel 300以上の便利なExcelツールが含まれています。 自由に30日に制限なしで試してみてください。 今すぐ入手. 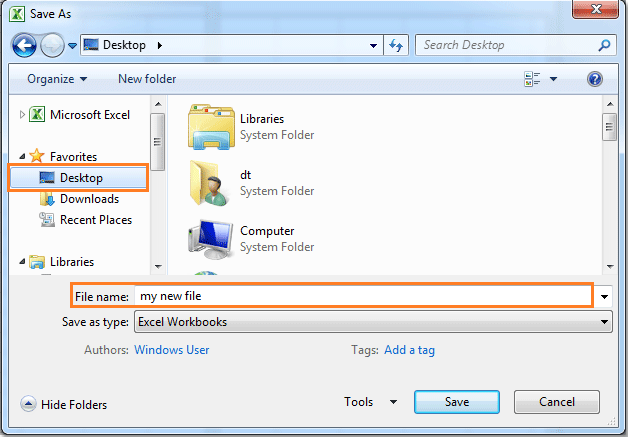 Liked the VBA option. Is there a way to retain formulas in new file? The data in new file is automatically pasted s 'values' and does not have the formulas. Do you know how I can do this on a default custom template? I have a lot of data in one book/sheet that I have to save only a selection to a new file. Option 2 works great. But, I need to have some information on the top for each new file I make (Copying and pasting is very tedious so I am looking for a quicker and more effective option). So would it be possible to first use the file with lots of data and select certain cells to save ON the default custom template I made, specifically underneath the header of the default template (the template is integrated into Excel to automatically open when I open Excel). Please help, thanks!! i have tried different things to make it copy+paste value, i dont know where i go wrong. This VB macro is great! However, I was wondering if there was a way to keep the source formatting when the selected range gets saved to a new workbook. Thanks! I am use the above VB macro, and works great. The only thing is that the range i select has a results from a formula and when i open the text file i get #REF.